Your little budgie is so delightful you thought adding another one to your "flock" would multiply the affection and fun. But once you got Tessie home, Francis turned into a bully who picks fights at the drop of a feather. Typically parakeets are social birds who can get along, but sometimes personalities clash -- especially when two females are involved. Fret not; you can keep your parakeet pair from fighting and maintain a harmonious home. If the feathers fly and one of your budgies terrorizes the other, keeping her from the food and water, the best action to take is getting them separate cages. It's a logical solution, but some parakeet parents try to wait the fighting out to see if their birds will get used to each other. That's a gamble that usually doesn't end up working well. For budgies who don't get along, it can take months or even years before they can tolerate each other, and some never become friends. Have separate cages for your budgies, placing them far enough apart that your bickering birds can't reach each other through the bars. You can eventually try moving them closer together if the animosity seems to be subsiding, but never force the issue of friendship on them. Sometimes fighting between budgies is instigated by jealousy. If your birds feel as if they're in constant competition for your affection, it can cause hostility and tension. Give your budgies equal amounts of quality time separately, as well as together. Give them their favorite treats when they're together, too, to reinforce a positive association with good behavior, yummy treats and each other. 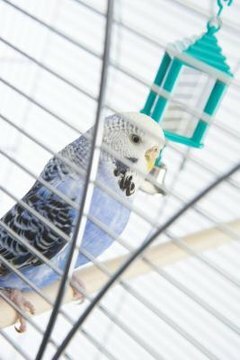 Budgies can be territorial when it comes to their cages, so don't allow your little birds to play together on one or the other's cage -- or anywhere that one has claimed as her own area. Only let them play together in neutral territory, and continue to supervise them so you'll be close at hand if a fight breaks out. Even if you have to invest in a brand-new play stand, it's worth it to keep skirmishes to a minimum or eliminate them altogether. If your budgies just don't get along, you'll have to break up at least one fight, if not more, over the course of their little lives. It can be a tricky thing to stop a fight in progress, as you don't want to hurt either of your birds. Parakeet parents whose birds have a tendency to fight keep some useful tools handy for just such occasions. A can filled halfway with coins or pebbles can be used for shaking to make a sudden noise that might startle your birds apart. In "Parrots for Dummies," Nikki Moustaki recommends having a stick and a towel handy to break up a bird brawl. Use the stick to gently drive them apart; wave the towel in an attempt to scare them into letting loose of each other. Once the fight has been stopped, gently and calmly pick your budgies up and return them to their separate cages for a time-out.